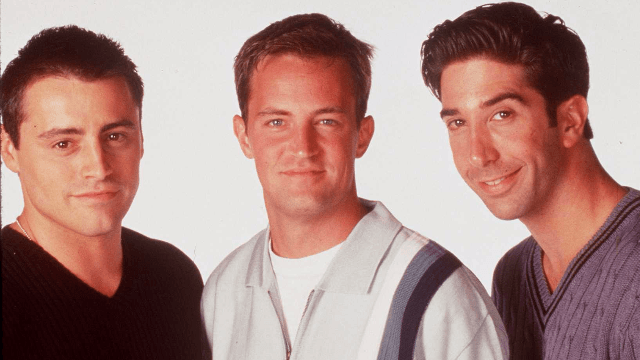 Friends may have aired its final episode over 10 years ago, but fans of the sitcom still love a good behind-the-scenes story involving Rachel, Monica, Phoebe, Joey, Chandler, and Ross. And Matt LeBlanc, who played lovable goof Joey, just treated Friends fans to the story behind the sling he wore on his arm in the third episode of the third season, "The One With The Jam." Chandler and I are fighting over the big down chair. I'm downstage at the table, and he comes in the door, we both look at each other, look at the chair, and neither one of us is sitting in it, so we both race to the chair, and I have to just step over the coffee table and land in this big, huge, comfortable chair. I don't even think it qualifies as a stunt. And somehow, I ended up completely upside down and I was gonna land on my head between the table and the chair, so I put my arm up to break my fall, and just exploded my shoulder. Because they were at a sitcom taping, the audience thought LeBlanc's tumble was part of the script, and everyone started laughing. Oof. So LeBlanc bottled up his pain and clambered backstage (through the door that represented Monica's room, which was actually just backstage). There, he ran into Anthony Edwards, who played a doctor on ER at the time. "He comes in, and I'm like, wow did I hit my head too? Because I know you're not a real doctor, get out of here!" LeBlanc said with a laugh. The next thing Matt LeBlanc recalls is the fire department arriving and the audience being sent home. To add insult to injury, the audience that night just happened to be comprised of Diet Coke contest winners, and because the taping was cut short, Warner Bros. had to fly them all back to California when they re-shot the episode. Eh, Warner Bros. could afford it. So in the spirit of getting the next episode filmed on schedule, the writers wrote Joey's sling into the show, saying that Joey injured his arm by jumping up and down on his bed. Although a visit to the hospital definitely would have definitely been on-theme in making the gang even later in "The One Where No One's Ready."